On September 1, 1894, two forest fires converged on the town of Hinckley, Minnesota, trapping over 2,000 people. Daniel J. 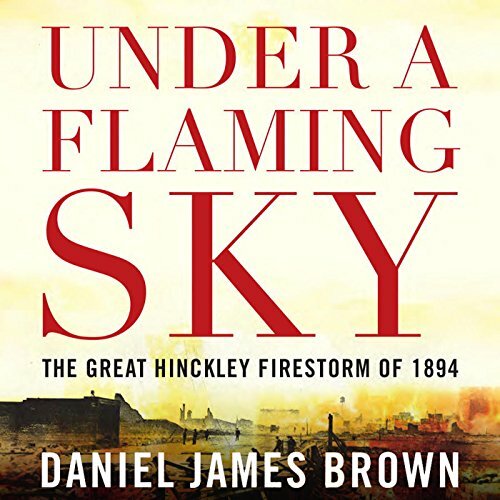 Brown recounts the events surrounding the fire in the first and only book to chronicle the dramatic story that unfolded. Whereas Oregon's famous "Biscuit" fire in 2002 burned 350,000 acres in one week, the Hinckley fire did the same damage in five hours. The fire created its own weather, including hurricane-strength winds, bubbles of plasmalike glowing gas, and 200-foot-tall flames. In some instances "fire whirls", or tornadoes of fire, danced out from the main body of the fire to knock down buildings and carry flaming debris into the sky. Temperatures reached 1,600 degrees Fahrenheit - the melting point of steel. As the fire surrounded the town, two railroads became the only means of escape. Two trains ran the gauntlet of fire. One train caught on fire from one end to the other. The heroic young African American porter ran up and down the length of the train, reassuring the passengers even as the flames tore at their clothes. On the other train, the engineer refused to back his locomotive out of town until the last possible minute of escape. In all, more than 400 people died, leading to a revolution in forestry management practices and federal agencies that monitor and fight wildfires today. Author Daniel Brown has woven together numerous survivors' stories, historical sources, and interviews with forest fire experts in a gripping narrative that tells the fascinating story of one of North America's most devastating fires and how it changed the nation.